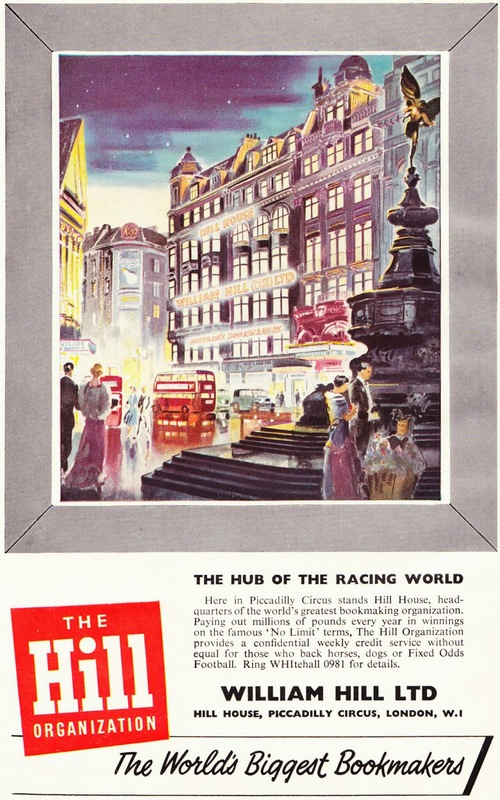 "Here in Piccadilly Circus stands Hill House2, headquarters of the world's greatest bookmaking organization. Paying out millions of pounds every year in winnings on the famous 'No Limit' terms, The Hill Organization provides a confidential weekly credit service without equal for those who back horses, dogs or Fixed Odds Football. Ringe WHItehall 0981 for details." 1. Burke's Peerage, which was founded in 1826, now describes itself as "the definitive guide to the genealogy and heraldry of the Peerage and Landed Gentry of the United Kingdom, the historical families of Ireland and the Commonwealth of Nations, the Imperial, Royal and mediatised families of Europe, the Presidential and distinguished families of the United States of America, and other prominent families worldwide." 2. No, not that Hill House. 3. Among the events you can place bets on today are: the Croatia vs. Switzerland U21 soccer match, the Washington Wizards vs. San Antonio Spurs NBA game, and the William Hill Grand Slam of Darts, featuring Simon Whitlock against Ted Hankey. Sure.